The electric light is one of the most important human inventions. Sleep and other daily rhythms in physiology and behavior, however, evolved in the natural light-dark cycle , and electrical lighting is thought to have disrupted these rhythms. Yet how much the age of electrical lighting has altered the human circadian clock is unknown. 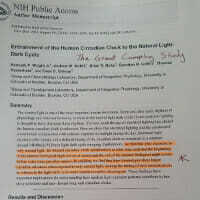 Here we show that electrical lighting and the constructed environment is associated with reduced exposure to sunlight during the day, increased light exposure after sunset, and a delayed timing of the circadian clock as compared to a summer natural 14 hr 40 min:9 hr 20 min light-dark cycle camping. Furthermore, we find that after exposure to only natural light, the internal circadian clock synchronizes to solar time such that the beginning of the internal biological night occurs at sunset and the end of the internal biological night occurs before wake time just after sunrise. In addition, we find that later chronotypes show larger circadian advances when exposed to only natural light, making the timing of their internal clocks in relation to the light-dark cycle more similar to earlier chronotypes. These findings have important implications for understanding how modern light exposure patterns contribute to late sleep schedules and may disrupt sleep and circadian clocks.